The Orbit Fox Companion plugin was created by Themeisle (originally) as an add-on for one of their themes, but it slowly became increasingly popular because of its variety of features. It is now compatible with any theme and can be shown on over 20 social networks. This is why Orbit Fox Companion is a popular way to increase one’s social engagement. This plugin is an extremely user-friendly one and has a number of different features that can make the user’s experience with creating a presence on social networks much simpler and easier. Orbit Fox breaks social engagement down into a science and allows the user the chance to engage in unique and convenient ways that were unimaginable before. Let’s take a deep look at its awesome features. Content Blocks which adds different widgets to the page builders (like Beaver Builder and Elementor, both of which are very effective when working with the Orbit Fox Companion). Thus, make the wise choice when looking for new ways to market your website and increase your social engagement and presence. 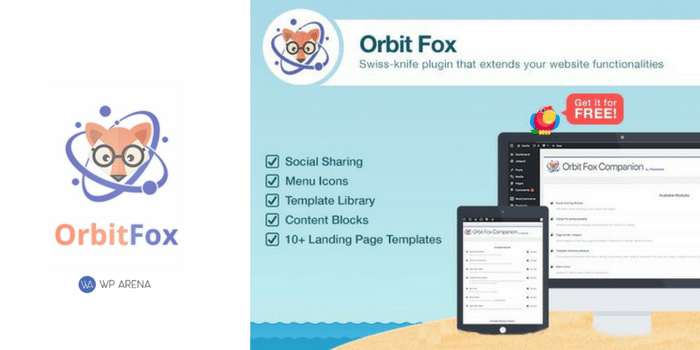 Choose Orbit Fox Companion and get the chance to use a comprehensive social plugin that can increase your website’s functionality with added features that will be facilitative in your website’s growth. Why Use Orbit Fox Companion? This plugin provides all of its essential features for absolutely no cost. So, not only is Orbit Fox Companion completely easy to use, it is also very easy to access and install. The fact that the essential features for this plugin are free means that you can expand upon the functionalities of your website with features that can help enhance your social network presence. This makes it extremely cost effective and you don’t have to worry about whether or not the plugin will give you value for your money. The plugin allows for a great amount of customization in that you can choose the menu icons that will be displayed on your website, you can choose from a number of templates that you would like to activate for your website’s landing page and you can choose from over 20 different social networks to include on your website. This customization is something you cannot find when using other plugins with similar functions. Another reason why the Orbit Fox Companion is the best option for anyone looking to engage their website more on social networks is that there is no need to create another account. The features will be added to your current admin dashboard and thus, it is highly convenient. Finally, the Themeisle team is very responsive and supportive. They instantly answer any and all queries in an efficient manner. Hence, making it easier for beginners to make use of this plugin. However, the grass isn’t always green on the other side, so it is important to be informed of the disadvantages of this plugin. First off, it may take some time for beginners to get a hang of how to use this plugin in an effective manner and it is more of a trial and error process. However, this can also be overcome with a little practice. Another disadvantage is that the features of this plugin may seem a little limited, but considering the fact that the essential features are free, the plugin provides complete value and is actually much more comprehensive when compared to other free plugins with similar functions. The Orbit Fox Companion is a new and convenient way for any website administrator to become more active on social networks and to get more people to become more engaged with their website. It gives the plugin user complete control of things like the social networks they would like to include and the icons they would like to display on their websites. This plugin helps the user create an integrated experience for their website visitors and this also makes marketing easier. The features make the website administrator or plugin user’s experience a convenient one because the plugin simply extends upon the admin’s already existent WordPress account and adds the features on the already existing dashboard. 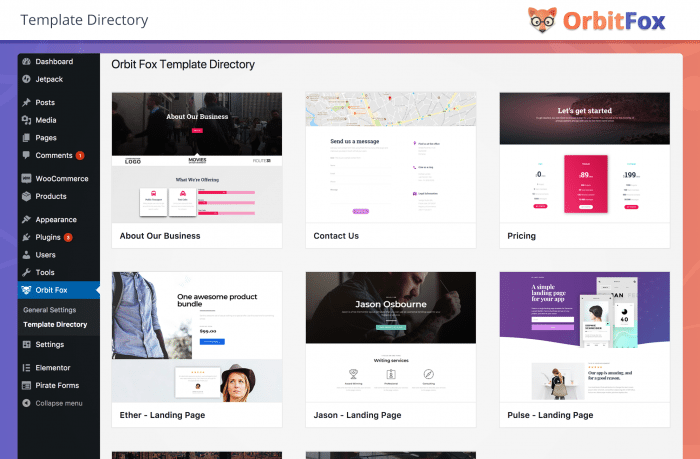 The variety of options available when it comes to the templates that are available and the social networks one can choose from are another reason why Orbit Fox has made a name for itself. 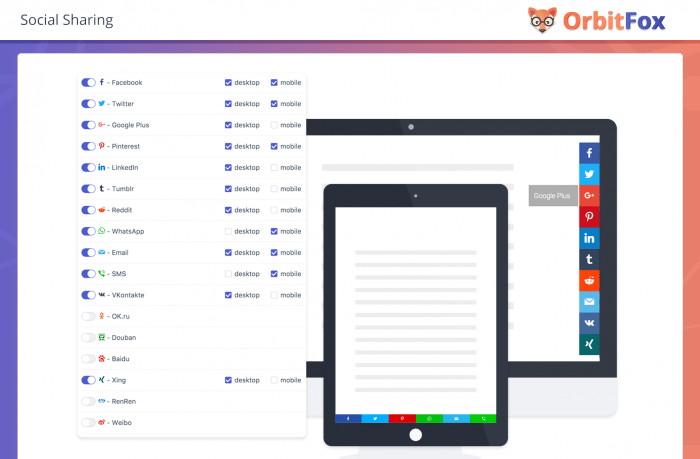 When building a website, one of the prime concerns for administrators is that they need options for every aspect of their website and Orbit Fox Companion addresses and resolves this issue head-on. Thus, try out the Orbit Fox today if you are looking for the best way to increase your WordPress website’s social engagement. Try Orbit Fox Companion Plugin Today! CSS Hero Review – The Most Advanced Real-Time WordPress Theme Customizer? I am going to check this for my blog. But if I need to use this plugin just for stats then which plugin is more effective? Monster Insight or this one?